Towards the end of February I had made my way down to southern California, in hopes of warmer weather and connecting with friends in Joshua Tree. I connected with my friends, but the weather surrounding my stay in the park was wet and questionable at first. Coming down the 101 from Santa Barbara south, and then cutting across around LA, was like driving in a tropical storm. While everyone was experiencing the monsoon like rainfall, I don’t think most people were experiencing the wind like I was. I don’t know if you knew this about Vanagons, but they are sort of boxy in design. When the wind blows, you are thrust into a fight or flight condition; all of sudden you are a ship at sea fighting the wind and waves to keep your boat on course. A constant struggle between lulls and gusts, sharply focused and readied to steer the van away from other cars, cars that have no idea the struggle going on beside them to keep my van between the lines. And so it was the majority of the drive to Joshua Tree. When I arrived in the park and found my friends at Ryan Campground, they too were hunkered down for the evening; the wind and rain making for unpleasant socializing. They bedded down early, and I was left to drink some port in the van with River. The hard rain on the tin topped roof made for a great night’s sleep. I love the sound of rain on the Vanagon’s roof. The next day was fairly dreary as well, but by evening time it had let up and the clouds began to part. 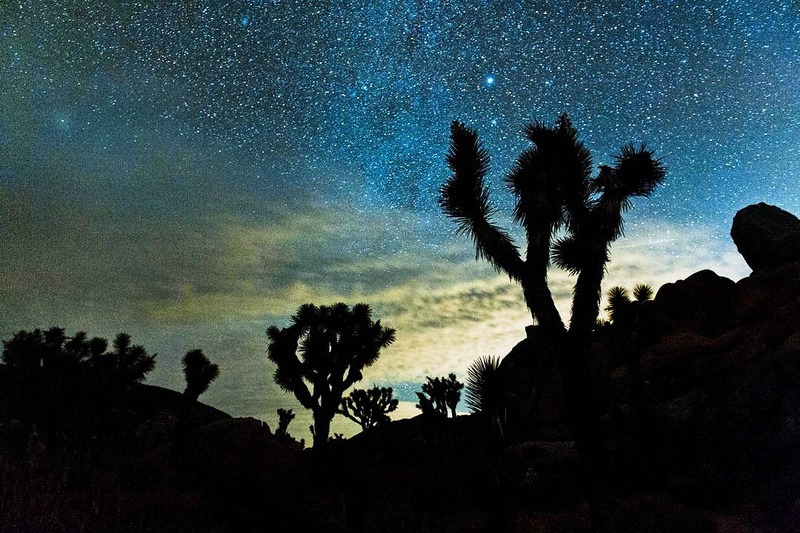 The night sky in JTree is beautiful; a giant open landscape with only small piles of rocks to obscure the view. The landscape is spotted with the bizarre silhouettes of Joshua Trees, stretched out like multi-armed monsters in the dark. With the wind and rain now passed, it is quiet here, quiet and dark. I would go on to spend the next couple days wandering around the park, meeting new people, and walking river around within 100′ of the roadways (a sad realization of dog restrictions came after I had made plans to be here). I got a chance to take the El Mariachi out for a spin into the desert as well, which while the roadways were buzzing with tourists, when you bike miles away from the road you have it all to yourself. I also got a chance to meet some great people at Climbers Coffee, a free even put on by the Parks Service for the climbing community. Free coffee – yeah, I’ll be there. At Climbers Coffee, I met some folks who informed me of a boulder near their camp, and expressed a willingness to let me try shooting some bouldering with off camera flash. Joshua Tree was great. A family emergency came up on my last day in the park, will delve into this another time, but I left the park a day early to head back into Yucaipa. The flowers should be blooming out there about now, so I am currently contemplating making another trip to the park this week. 1. how has it been in the van during the winter? still enjoyable or should I just wait until the summer to take the plunge? 2. Have you had any difficulties finding dispersed/free camping during the winter? this is one of my main concerns — not finding anywhere to sleep or driving out to a service road only to find it’s been closed for the winter. Hey! While it is winter, down this direction the nights have only been getting down to about 32, so not warm, but not bad. If you have a decent sleeping bag, it’s just like camping, maybe a little warmer if you have insulated curtains. I have most of mine covered with at thermal blanket curtain, but the front area to the chairs is still open so I lose a lot of heat out that way. As for free camping, unsure. I stayed in the park itself. Campsites are $15 a night, so not bad by California standards. There is no snow out there, so cannot imagine any of the service roads being closed. I want to go out and explore the surrounding areas and see if I can find some free sites. Will keep you posted.